I decided that, this week of all weeks, I needed to catch a break. I’d been nearly broken by icky glazed duck, by grotty kebab meat hiding under squeezy cheese, by skanky burgers and lukewarm chips, by (admittedly good) food brought out at breakneck pace. There was no denying it: I was long overdue a good meal. 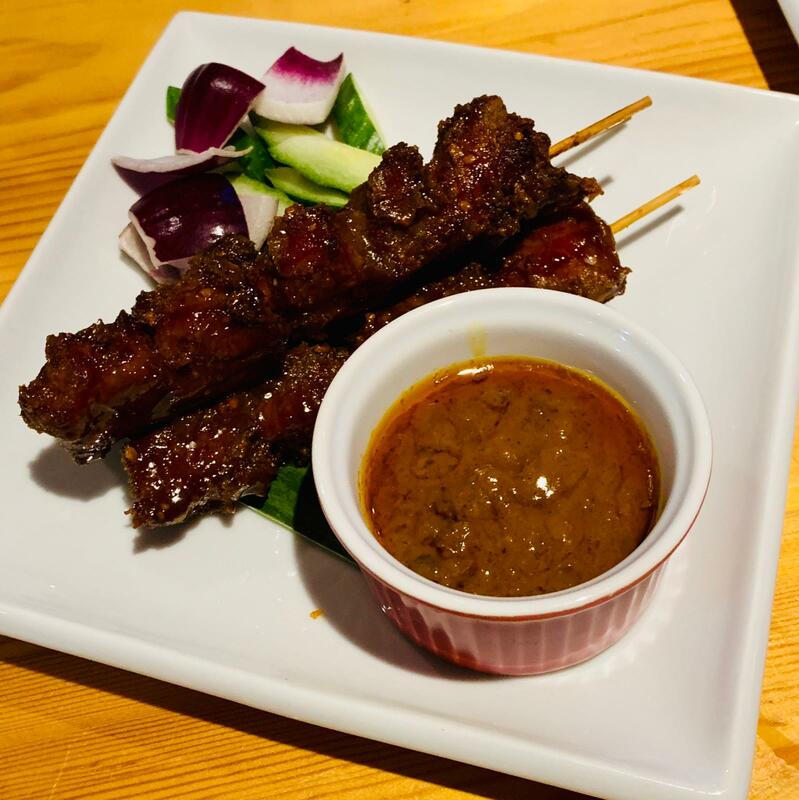 I was after a sure thing, or as close to that as you can get in the world of restaurants. So this week I made for Gare Du Ding and I hopped on a train to Goring. I intended to try out the Miller Of Mansfield, the much-lauded not-quite-restaurant-not-quite-pub which won the Good Food Guide’s Restaurant Of The Year a few years back. My companion this week deserved a good meal even more than I did: I went to the Miller with John Luther, who runs South Street and was first seen on this blog last September enduring a truly iffy Lebanese meal at Alona. I still occasionally have nightmares about the wobbly shawarma there, and my other half sometimes shows people the picture of it on her phone, the equivalent of the contents of Compo’s matchbox, or Alan Partridge’s top drawer at the Linton Travel Tavern. In fact, I think she may have done so at the last ER readers’ lunch, which poor John attended: talk about insensitive. After that horror, I wasn’t sure John would ever want to be invited back, so when he asked to join me again I decided I’d take him somewhere truly promising to make amends. Goring is a lovely place, and the train there was full of well-to-do folk who seemed disgusted by John’s and my conversation about – yes, I’m afraid so – Brexit. The Miller is a short walk from the station and even on a dim and drizzly winter evening I was reminded of what a beautiful, prosperous village it is. It’s a big handsome building, warm and welcoming, and on arrival we were given the option of eating in the pub or the restaurant. The pub was cosier, although some of the tables felt more suitable for drinking than eating, but I actually decided to sit in the restaurant because I felt that restaurant prices felt more well-matched to sitting in a restaurant. Funny how the mind works, sometimes. I did wonder, later on, if I’d made the wrong decision: the dining room was nice enough, if a little nondescript, and a big table was laid for about a dozen people. We were sat near the back – well, almost, as we were sat next to a screen which had been put there to make the room seem smaller (I could make out another two tables beyond it). That meant that John had a view of pretty much the whole room (and all the people-watching opportunities that came with it) and I was sat looking at a screen. It felt a little unspecial, but perhaps Goring was the kind of village so prosperous that the Miller wasn’t seen as a special occasion restaurant, the kind of place where people were happy to sit in the pub and pay twenty-five pounds for a main course. Looking at the menu, when it eventually arrived (“I just realised these might enhance your dining experience” said the waitress who brought them over ten minutes later, quite winningly actually) made me think that if the food lived up to its promise then I’d also have been perfectly happy to pay twenty-five pounds for a main. 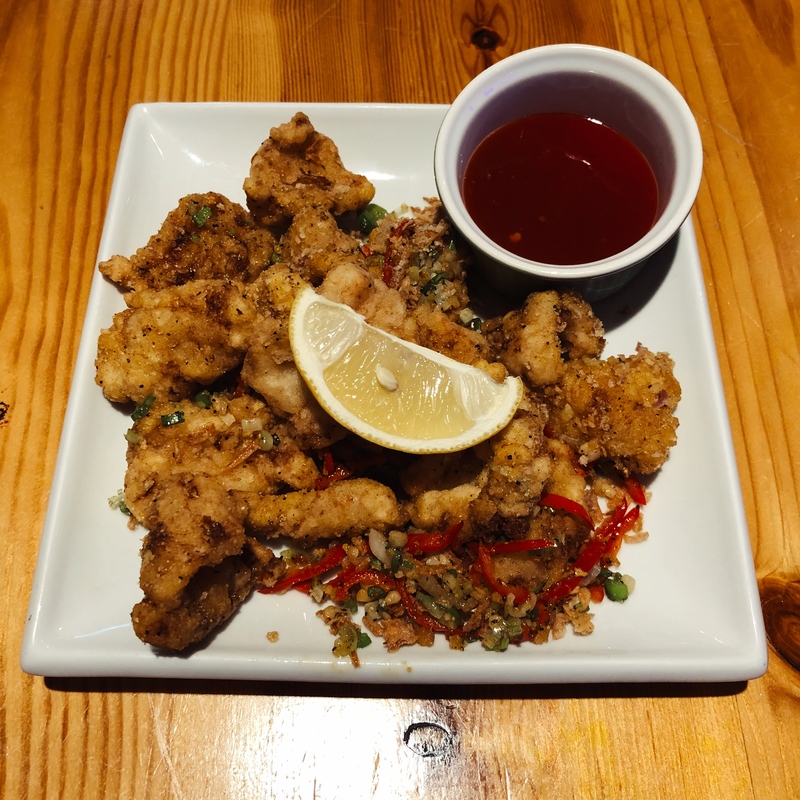 All sorts of good stuff jumped off the page – smoked almonds and Comté as a nibble, gravadlax with crispy quail’s egg, soy glazed monkfish with confit pork, the list went on and on. Just as well, as I’d told John he could choose first (atoning for that shawarma again) so I also had to work out my plan B: I didn’t need it for the mains, but I had to rely on it for the starters. Before that, we had to choose a wine. We both fancied a white, and the list had lots of appealing choices well before silly money. We were torn between a Grüner Veltliner (“my wife’s favourite”, John told me) and an Albarino, but ended up opting for the latter so it wouldn’t feel too much like rubbing it in when John got home and told Mrs Luther all about it. John then started telling me a story about drinking Albarino in Spain – “they pretty much hand it out for free over there” he said, and I pointed out that the wait staff probably wouldn’t fall for that. Goring, after all, is very much not the continent. Anyway, the wine was superb – fresh, lively, almost-sharp – and felt decent value at just under forty pounds. We were nursing it for a while because, again, it felt like some time before anybody returned to take our order – a shame, as we could gladly have been picking at some nibbles by then. The couple at the table next to us wandered off out front leaving half of their starters still there on the table, and I unworthily wondered to myself if they’d notice a smidge of it going missing. This was well before the boisterous table for twelve turned up, so it wasn’t as if the restaurant was rushed off its feet, but the whole thing felt a little odd. Anyway, enough quibbles: let’s move on to the food, because it was easily special enough to make you turn a blind eye to any glitches in service or being seated facing a screen. 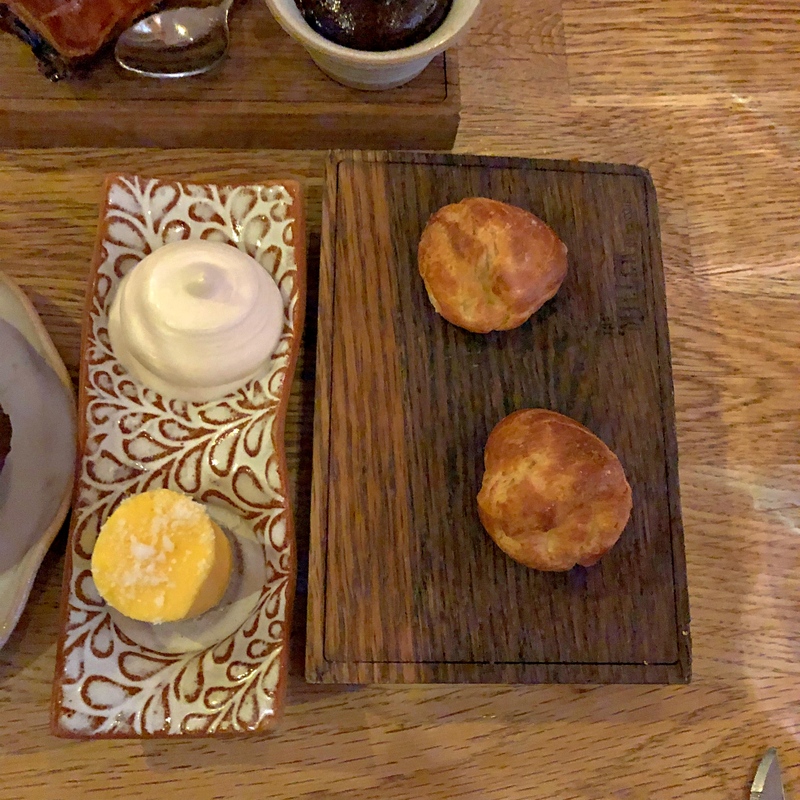 A little loaf of sourdough came to the table with churned butter and whipped bacon butter – all of these were fantastic but the taste of smoked streaky sneaking through in the whipped butter was nothing short of sorcery. The gougeres, a pair of little savoury profiteroles packing a real punch of blue cheese, were an absolute delight. 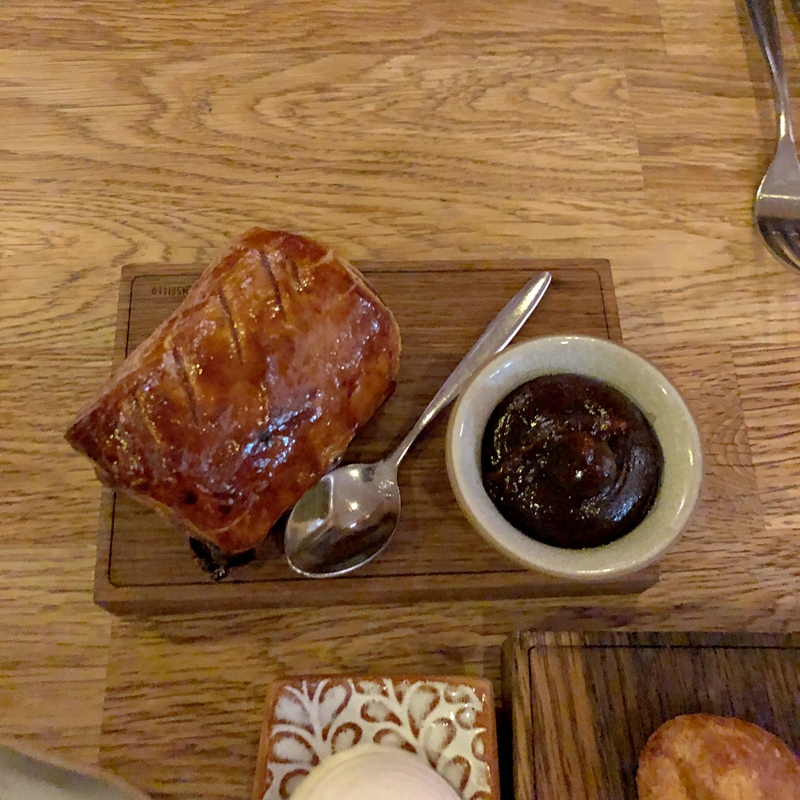 We’d also ordered a venison sausage roll, which came with home-made brown sauce. It was just under a fiver and really quite generously sized: I can be a very greedy diner, but even I would struggle to describe it as a nibble. “We have a rule in my house that whoever cuts has to choose last” said John, before dividing the sausage roll into two such unequal halves that I almost felt guilty scoffing the bigger one, until I remembered that he was having the oxtail croquette and I wasn’t. It was phenomenal, the venison lean and dense and again with a beautiful whiff of wintry woodsmoke. The brown sauce was heavenly, although the sausage roll really didn’t need it. “It almost has too much sausagemeat” said John; I managed to avoid doing an obvious double take. The second nibble was less successful. The rabbit rillette itself was delicious, full of rich strands, the whole thing topped with a truly beautiful sweet jelly that felt like it had a touch of something like Sauternes in it. But the “lavroche crackers” were long, thin, impractical and just not worth the bother. We put some of the rillette (not an easy thing to spread on a brittle, narrow rectangle of cracker) on them before giving up and sticking the rest on the sourdough, which is possibly where it should have been all along. The starters, if anything, were even better. John had the oxtail croquette, which meant that I had a side portion of envy. It was a single, beautiful thing which came on a bed of parsnip puree, served on a dish which looked alarmingly like a section of tree trunk. By this point the lighting in the Miller had reached a level which would defeat all attempts at photography, and my picture of this dish was so bad (disturbingly so) that you’ll have to take my word for it. It was dotted with little blobs of dill and shallots, and the taste I had was properly fantastic, deep in flavour with shreds of magnificent beef. “This is like a really middle class Findus Crispy Pancake”, I said: John nodded, probably humouring me. I had chosen the cauliflower lasagne, and although it didn’t live up to the croquette it was an intriguing dish. 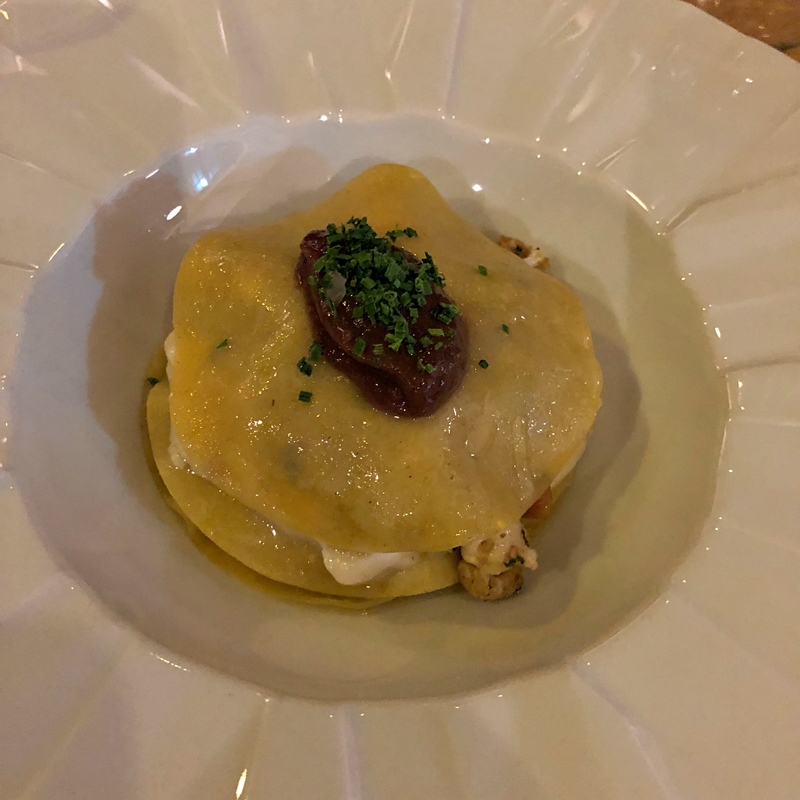 More of an open lasagne, really, but I wish there had been more of the cauliflower and less of the hazelnut, which was billed as a “hazelnut crumble” but felt coarser than that and took over the whole thing more than I’d have liked. It was saved by a truly astounding caper and raisin puree which simultaneously managed to taste of both and neither, a mind-bending sort of agrodolce which transformed the dish into something rather special. I don’t even like raisins, but I could have eaten this until the cows came home. Somewhere between the last mouthful of the starters and the arrival of our main courses, John and I ran out of wine. So we asked nicely if somebody could bring us the wine list again. 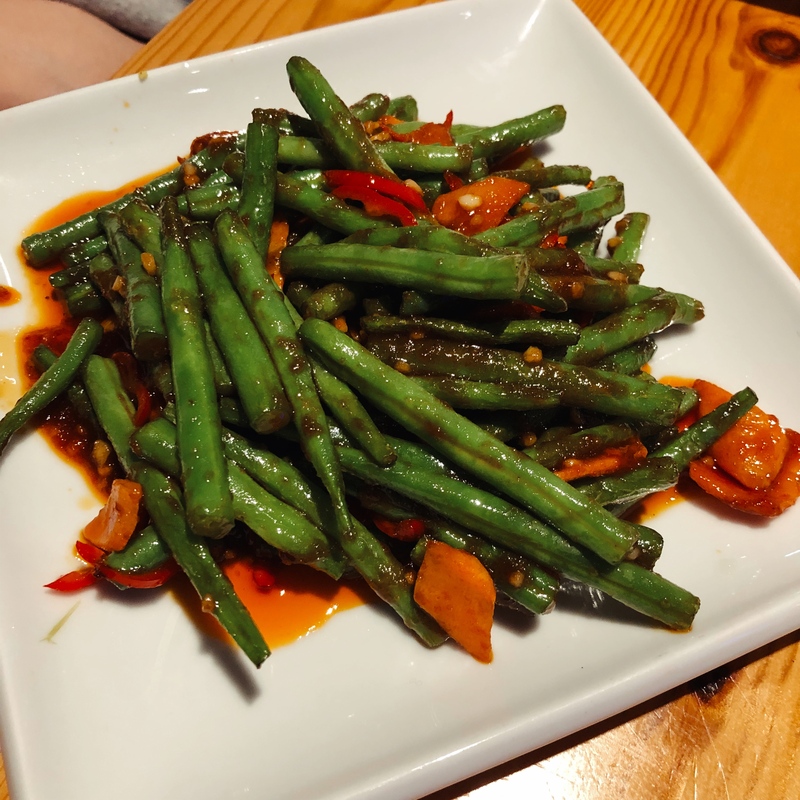 It didn’t arrive, and I seem to remember we asked again, but even as our main courses were brought to the table we had to ask again and a very apologetic waitress returned with the list. We ordered straight away – a glass of New Zealand pinot noir for me, some Picpoul de Pinet for John – mainly because I was worried that if we didn’t we might never see wine again (both, incidentally, were cracking). In fairness, by this time the large table nearby was in full swing and I can see that would take up a lot of time and attention. 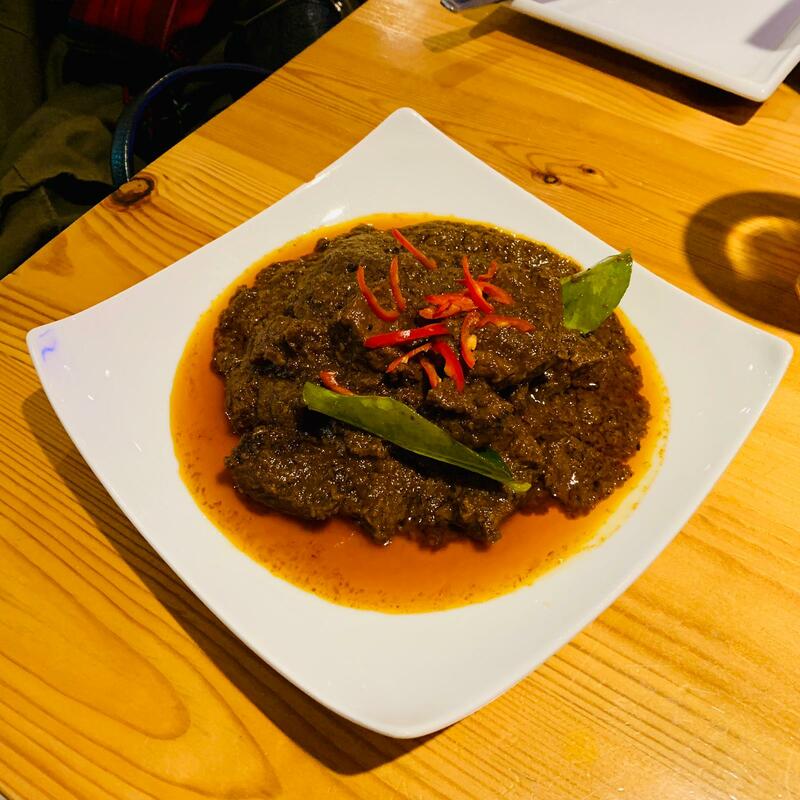 But even having said that, the service throughout – although never less than lovely – was a little more slapdash than I’d expect from food at this level. When we were served by Mary (who, along with her husband Nick, owns the restaurant and who runs the front of house) everything was brilliant, but when she wasn’t there the rest of the wait staff somehow went missing in action. But anyway, let’s return to the food (again) – because it redeemed a multitude of sins and because my main course, one of the best things I’ve eaten in a long time, was specifically recommended by Mary. Breast of wild duck came served on a heap of sauerkraut (one of my very favourite things) with thin discs of sweet beetroot sitting under the whole thing. The duck was as tender as any I can remember, and perfect on a wintry night. I could eat sauerkraut until it came out of my ears, and this was joyous, as was the glossy sauce (made with duck heart, according to the menu) that brought it all together. I might have liked the accompanying croquette to have a little more duck leg and a little less spud (I’d been spoiled by my taste of John’s starter) but that might have been just me. 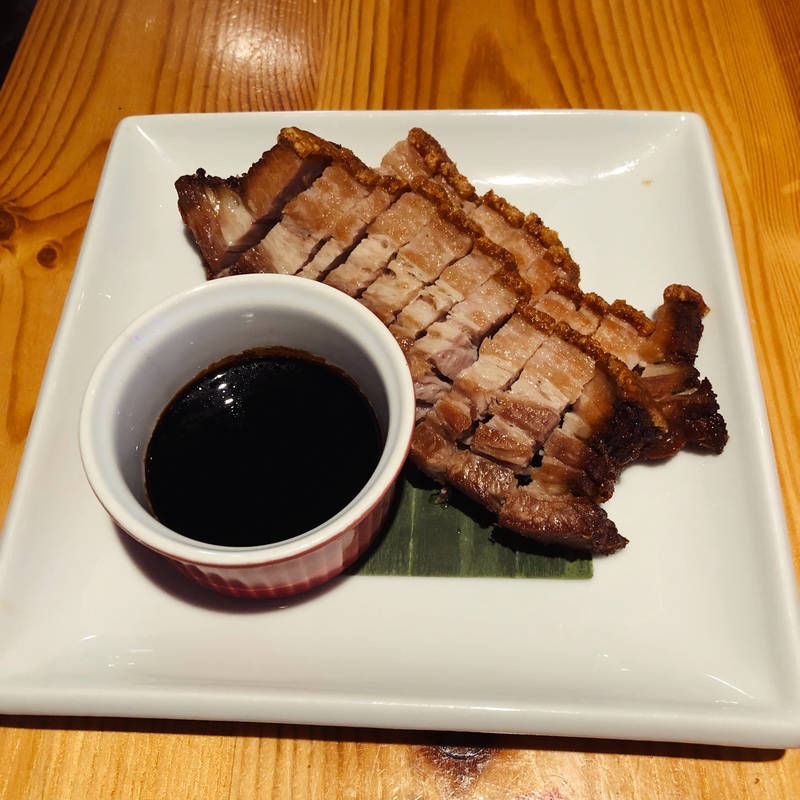 But no matter, because even better was the little pan of “duck crackers” brought to the table – they looked like prawn crackers, they had their texture too but the taste, all duck and smoke, was a little miracle. I let John try some, and tried not to be too smug. Again, I’ve not put my crappy photograph up because, however badly I may have written this, my words are still better. John’s main course, in any event, was no slouch. 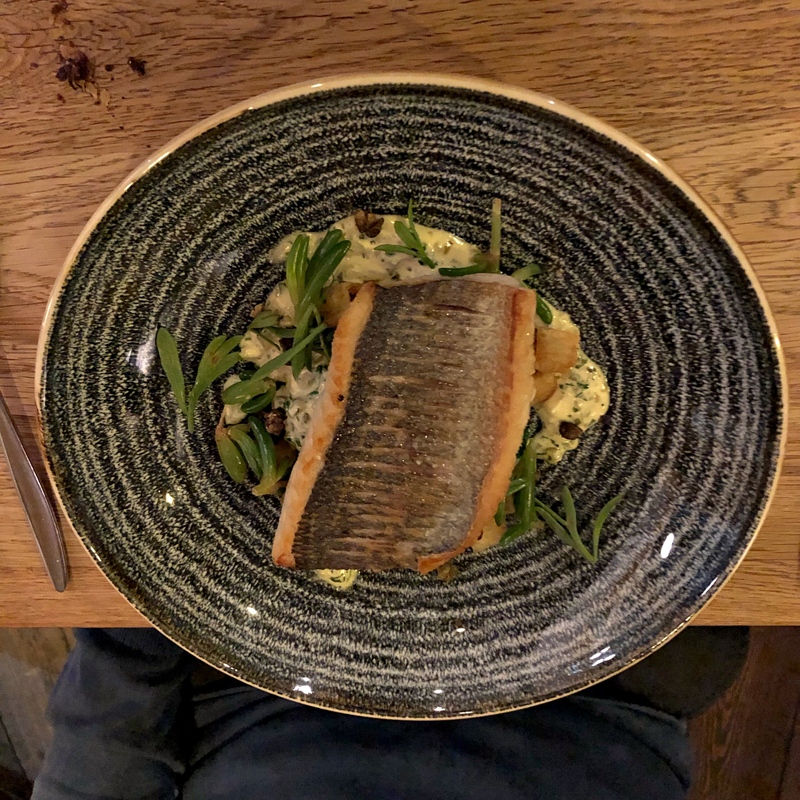 His sea bream came with greens, crispy capers (one of the finest things in the world, if you ask me), a very good tartare sauce and something called “salty fingers” which is a sea vegetable a little like samphire. I did a Google image search of salty fingers as part of the research for this review and was relieved that it didn’t throw up anything dodgy (the infamous Leslie Grantham webcam still, for instance): perhaps it was just my dirty mind that led me to fear the worst. John was a big fan of this dish, and from my forkful I could completely see why. “It has just enough greens,” he said, “although if I’m being fussy I wish the skin had been properly crispy”. We also ordered some chips – because Mary had told us they were good – and she wasn’t wrong, although under the circumstances they were probably excessive. They defeated John anyway, leaving him too full for dessert. But since I saw one on the menu that I just had to try, I ordered it all the same and told the waitress that she could bring two spoons. “We’re not a couple though” I told her, almost certainly unnecessarily. 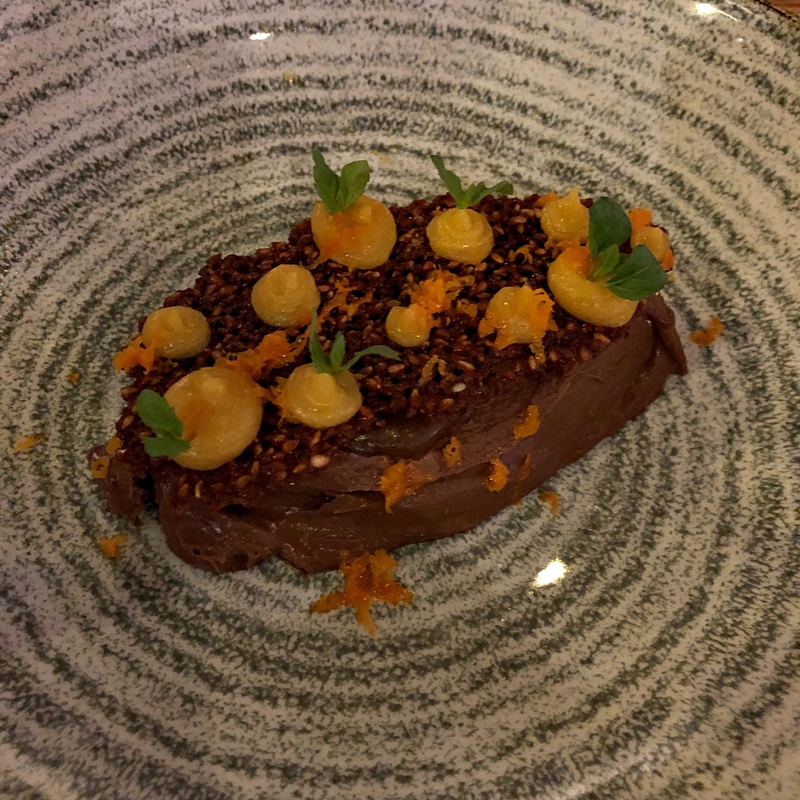 I wasn’t sure what to expect from “chocolate custard” – I was hoping the emphasis would be more on the chocolate and less on the custard – but what arrived was far more beautiful than I can describe and hundreds of times more appealing than the photo below makes it look. The texture was like crème brulee, or a mousse with no bubbles, not as dense as a ganache but no less rich and intense for that. On top was a sheet of tuile rich with salt and sesame and the whole thing was dotted with little spheres of bright sweet orange. John is an awfully well-mannered dining companion – he took the smaller half of the sausage roll, he let me finish the rillette, he practically apologised to the wait staff for them not having brought us the wine list yet – but even so I was relieved when he put down his spoon and gave me a clear run on the rest of the dessert. It was properly magnificent. While we were waiting for our bill to arrive (and finishing off some beautiful, chewy macarons with vanilla custard which had been brought as an extra treat) we compared notes. John told me he was mentally already planning a trip back with his wife, and in truth I had also been trying to work out a good excuse to return. John knows his restaurants – we swapped stories of great meals we’d had, talked about places on our hit list and talked about how we should beetle off to London one weekday when we were both free and have lunch at Medlar, my favourite London spot, right at the unfashionable end of Chelsea. “That’s always a sign of a really good restaurant”, I said, “that before you’ve finished meal one you’re planning meal two.” And although John and I both ordered well, the menu was littered with roads not taken – not only that, but I knew perfectly well that by the time I visited the Miller again the menu would probably look completely different. Dinner came to one hundred and forty pounds, not including tip, and personally I didn’t resent a single penny of it. 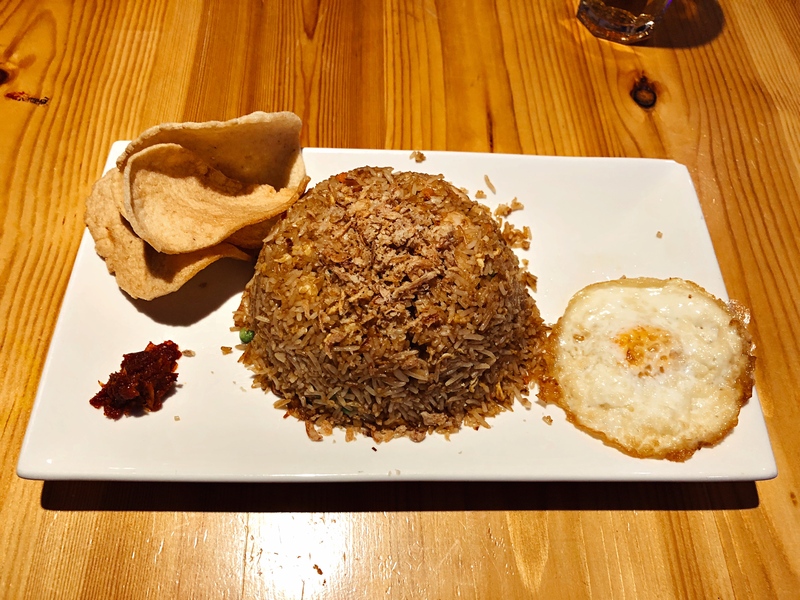 I often complain that Reading is lacking a true special occasion restaurant, and that even the options nearby are either too unspecial, too fussy, too full of themselves or just too difficult to get to. The Bottle & Glass in Binfield Heath, The Royal Oak at Paley Street, The Crown at Burchetts Green even: somehow they all fall short, to the extent where my family often congregate at the Crooked Billet in Stoke Row when they want to celebrate a birthday. For me, the Miller Of Mansfield comes closest to filling that gap. I know the service was a little haphazard, and I struggled to warm to the room, but it’s so genuine and likeable that none of that seems to matter. More importantly, the food reaches heights that render all of that somewhat of a moot point. I went expecting to like it a great deal but maybe not love it and, based on other reports I’ve had, I wondered if I would leave slightly hungry. Well, none of that came to pass, and instead I have a new place to go for celebrations, blow-outs or even just decadent midweek dinners with a new friend. All that and it’s only thirteen minutes from Reading by train. What more could you ask?